The GRENKE Chess Classic takes place in two venues, first of all in Karlsruhe for the first 5 rounds before moving to Baden Baden for the final rounds. World Champion Magnus Carlsen, straight off the back of a magnificient 7/9 in the Gashimov Memorial will be hoping to repeat the trick here. 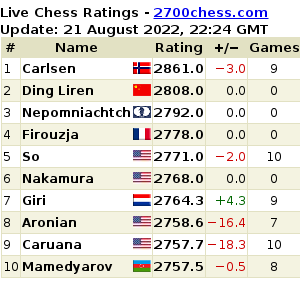 Fabiano Caruana faces Carlsen for the first time since their World Championship match last year. Anand, MVL, Aronian, Svidler, Naiditsch, Vallejo Pons, Meier and finally 14 year old Vincent Keymer who earned the right to play in the event by winning the open alongside last year. The Israeli Team Championship took place Sat 5th Jan 2019 to Fri 5th Apr 2019. Games available. I don't have a final table yet but Ashdod Elit seem to have won the event.